Pulsair presents the CSO mixing systems. 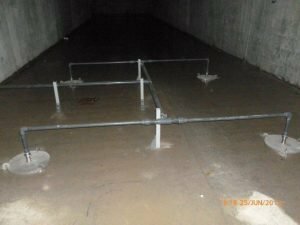 Combined sewer overflow (CSO) tanks and basins are designed to collect surface runoff and handle extra wastewater during peak periods when wet weather flow exceed the normal capacity of the wastewater treatment plant. Adding wastewater disinfectants to these tanks and basins is critical to treat as much of the wastewater as possible to in order to protect the environment and natural waterways. 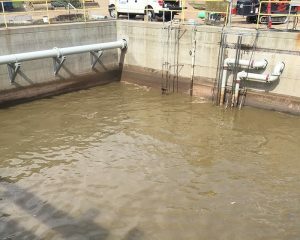 Proper mixing is needed to ensure uniform distribution of disinfectants as well as keeping the solids suspended so the wastewater can be properly treated if a CSO storage tank is used after the peak wet period has ended. CSO channels are typically characterized by high and fluctuating flow rates. The Pulsair mixing process has been proven to uniformly disperse chemical disinfectant into fast flowing channels and chlorine contact chambers. The Pulsair mixing process fast, highly energy efficient and requires zero maintenance inside the tank, basin or chamber.